Gentle readers, are you getting pumped for an exciting weekend in Ypsilanti? 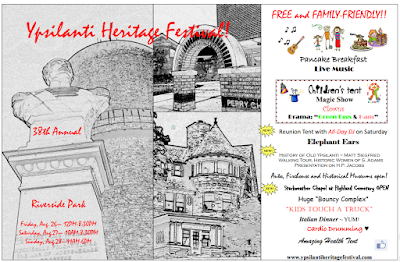 Heritage Festival starts tonight and runs through Sunday in Riverside Park. It promises live music and an eclectic mix of history, entertainment and vendors. If you're looking for a reason to get out of Ann Arbor, look no further. After you check out Heritage Fest, why not swing by DIYpsi, it's just up the hill at Corner Brewery. DIYpsi will also feature an eclectic group of vendors hawking their wares. It's always a fun event. So gentle reader, will we see you in Ypsi this weekend?